As gift giving occasions arise many parents and grandparents have a difficult time trying to choose presents that they feel good about giving to the kids in their lives. Sporting equipment is always a good choice for active kids of all ages, encouraging them to make fitness a priority. Even the youngest babies need a certain amount of activity in order to grow and develop properly. Newborns get to work almost immediately, moving their arms and legs and attempting to lift their heads. Parents and other carers should do all that they can to encourage this tendency toward activity, rewarding babies with smiles, hugs, and happy words of praise. Activity centres and play-mats that encourage reaching, stretching, and grasping are good, as are bright, colorful toys that parents can place just out of reach to encourage babies to scoot and crawl. Jumpers and bouncers are great choices, helping to keep babies happily and actively engaged. As babies grow, small push cars and other basic movement toys work well for them, encouraging standing and first steps. Young children tend to be naturally active, enjoying simple activities such as running, jumping, and climbing. Playground balls, beginner roller skates, tricycles, and other kid-propelled vehicles are popular with preschool aged kids, giving them healthy outlets for their abundant energy. 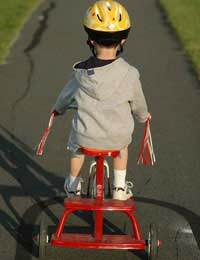 Safety gear, such as helmets and possibly knee and elbow pads make good accompaniments to gifts of bikes, trikes, and skates. Preschoolers also enjoy being helpful, so this is the perfect age to buy them child-sized versions of gardening tools and other gadgets that allow them to work side by side with Mum and Dad. Finally, videos are popular with kids and there are a number of quality DVDs on the market today that encourage young kids to get up and dance or learn the basics of popular exercises such as yoga. If funds are available, the ultimate gift for preschool aged kids is probably a climbing frame or other piece of outdoor play equipment. Well chosen climbing frames and activity centres provide kids with countless hours of active play and with the proper accessories, can be used for many years as the children’s skills improve. By the time that they are in school, many kids begin expressing an interest in specific sports or activities, and parents are wise to encourage their children’s desire to participate in these active endeavors. Lessons for instruction in dance, golf, tennis, swimming, ice skating or other physically challenging activities make terrific gifts, promoting fitness and increasing social interaction. Gifts of video gaming systems are sure to bring smiles to the faces of school aged kids, and when the systems are teamed with some of the active games available, both the child and their parents will be delighted. Sporting goods, such as skis, skateboards, rollerblades, and golf clubs are great gifts for growing athletes, helping them to develop their abilities. ideos are still popular choices at this age, and instructional DVDs are available for a wide range of activities from basic aerobics to martial arts training. Gifts that encourage fun and fitness don’t have to cost a lot of money. Kids in this age range often enjoy some of the simplest and most timeless gifts, including jump ropes, hula hoops, and other inexpensive toys. If they don’t already have one, parents of children this age should try to get their kids bicycles – and when it is safe to do so, the kids should be encouraged to consider walking or bike riding to be their everyday mode of transportation. Many teenagers are already quite adept at one or two sports, so advanced lessons and high quality sporting equipment may be good investments in their future continued fitness and god health. Golf clubs or skis are sure to be appreciated by teens who have dabbled in these sports and are ready to take their abilities to higher levels. Trampolines can provide great workouts, but parents must be sure that their teens use them with safety in mind, closely following manufacturer’s instructions of proper installation and usage. Athletic lessons and specialised, one-on-one coaching sessions make great gifts for sports minded teens, as does camping gear and other outdoor equipment. Families may choose to schedule active holidays as gifts for the entire family. Camping, hiking, horseback riding or skiing getaways are great for fitness, fun, and family bonding.